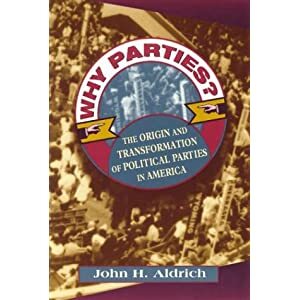 This article presents the historical development and role of political parties in United States politics, and outlines more extensively the significant modern political parties. Throughout most of its history, American politics have been dominated by a two-party system. However, the United States Constitution has always been silent on the issue of political parties; at the time it was signed in 1787, there were no parties in the nation. Indeed, no nation in the world had voter-based political parties. The need to win popular support in arepublic led to the formation of political parties in the 1790s. Americans were especially innovative in devising new campaign techniques that linked public opinion with public policy through the party. Political scientists and historians have divided the development of America's two-party system into five eras. The modern two-party system consists of the Democratic Party and the Republican Party. In general, since the 1930s the Democratic Party positions itself left-of-center in American politics while the Republican Party positions itself as right-of-center. Several third parties also operate in the United States, and from time to time achieve relatively minor representation at the national and state levels. The United States Constitution has never formally addressed the issue of political parties. The Founding Fathers did not originally intend for American politics to be partisan. In Federalist Papers No. 9 and No. 10, Alexander Hamilton and James Madison, respectively, wrote specifically about the dangers of domestic political factions. 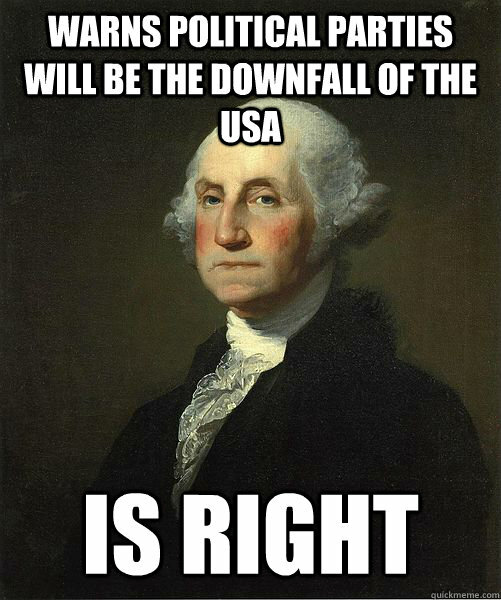 In addition, the first President of the United States,George Washington, was not a member of any political party at the time of his election or throughout his tenure as president. Furthermore, he hoped that political parties would not be formed, fearing conflict and stagnation Nevertheless, the beginnings of the American two-party system emerged from his immediate circle of advisers, including Hamilton and Madison. The First Party System of The United States featured the Federalist Party and the Democratic-Republican Party. The Federalist Party grew from Washington's Secretary of the Treasury, Alexander Hamilton, who favored a strong united central government, close ties to Britain, an effective banking system, and close links between the government and men of wealth. The Democratic-Republican Party was founded by James Madison and by Washington's Secretary of State, Thomas Jefferson, who strongly opposed Hamilton's agenda. The Era of Good Feelings (1816–1824), marked the end of the First Party System. The elitism of the Federalists had diminished their appeal, and their refusal to support the War of 1812 verged on secession and was a devastating blow when the war ended well. The Era of Good Feelings under President James Monroe (1816-24) marked a brief period in which partisanship was minimal. These good feelings inspired the first short-lived "era of internal improvements" from the 18th through the 25th Congress, which ended with the panic of 1837. In 1828, The Second Party System saw a split of the Democratic-Republican Party into the Jacksonian Democrats, who grew into the modern Democratic Party, led by Andrew Jackson, and the Whig Party, led by Henry Clay. The Democrats supported the primacy of the Presidency over the other branches of government, and opposed the Bank of the United States as well as modernizing programs that they felt would build up industry at the expense of the taxpayer. The Whigs, on the other hand, advocated the primacy of Congress over the executive branch as well as policies of modernization and economic protectionism. Central political battles of this era were the Bank War and the Spoils system of federal patronage. The Third Party System stretched from 1854 to the mid 1890s, and was characterized by the emergence of the anti-slavery Republican Party, which adopted many of the economic policies of the Whigs, such as national banks, railroads, high tariffs, homesteads and aid to land grant colleges. Civil war and Reconstruction issues polarized the parties until the Compromise of 1877, which ended the latter. Thus, both parties became broad-based voting coalitions. The race issue pulled newly enfranchised African Americans (Freedmen) into the Republican party while white southerners (Redeemers) joined the Democratic Party. The Democratic coalition also had conservative pro-business Bourbon Democrats, traditional Democrats in the North (many of them former Copperheads), and Catholic immigrants, among others. The Republican coalition also consisted of businessmen, shop owners, skilled craftsmen, clerks and professionals who were attracted to the party's modernization policies. The Fourth Party System, 1896 to 1932, retained the same primary parties as the Third Party System, but saw major shifts in the central issues of debate. This period also corresponded to the Progressive Era, and was dominated by the Republican Party. It began after the Republicans blamed the Democrats on the Panic of 1893, which later resulted in William McKinley's victory overWilliam Jennings Bryan in the 1896 presidential election. The central domestic issues changed to government regulation of railroads and large corporations ("trusts"), the protective tariff, the role of labor unions, child labor, the need for a new banking system, corruption in party politics, primary elections, direct election of senators, racial segregation, efficiency in government, women's suffrage, and control of immigration. Most voting blocs continued unchanged, but some realignment took place, giving Republicans dominance in the industrial Northeast and new strength in the border states. The Fifth Party System emerged with the New Deal Coalition beginning in 1933. The Republicans began losing support after the Great Depression, giving rise to Democratic President Franklin D. Roosevelt and the activist New Deal. They promoted American liberalism, anchored in a coalition of specific liberal groups, especially ethno-religious constituencies (Catholics, Jews, African Americans), white Southerners, well-organized labor unions, urban machines, progressive intellectuals, and populist farm groups. Opposition Republicans were split between a conservative wing, led by Ohio Senator Robert A. Taft, and a more successful moderate wing exemplified by the politics of Northeastern leaders such as Nelson Rockefeller, Jacob Javits, and Henry Cabot Lodge. Experts debate whether this era ended in the mid-1960s when the New Deal coalition did, the early 1980s when the Moral Majority and the Reagan coalition were formed, the mid-1990s during the Republican Revolution, or continues to the present. The modern political party system in the United States is a two-party system dominated by the Democratic Party (Liberal) and the Republican Party (Conservative). These two parties have won every United States presidential election since 1852 and have controlled the United States Congress since at least 1856. Several other third parties from time to time achieve relatively minor representation at the national and state levels. esos conocimientos, de recibir feedback sobre ellos en red. Sin embargo echo de menos la experiencia de aprendizaje maestro alumno, donde actitudes y virtudes humanas son compartidas, también echo de menos la reflexión pausada sobre los imputs recibidos. No se puede tener todo soy consciente de que si tenemos un sunami de información tenemos poco tiempo de elaboración, sin embargo considero que es necesaria la reflexión, saborear tranquilamente, rumiar las entradas, o nos perderemos la parte que de sabiduría puede crear el ser humano, para crear se necesita tiempo de digestión. Creo que como educadores tendríamos que enseñar a organizar el tiempo y ser conscientes de que es necesario que tengamos información, mucha y diversa, pero que tengamos un tiempo para encajarla entre nuestros conocimientos y creencias. Son mas de 3500 peliculas !!! Ni un soldado ni marino fuera de España, pa qué?